TH-125-2 10-20 2 1 1/4"
TH-150-4 20-40 4 1 1/2"
TH-250-9 45-90 9 2 1/2"
All flow rates are shown with part number. There is a maximum number of inserts in a given size. 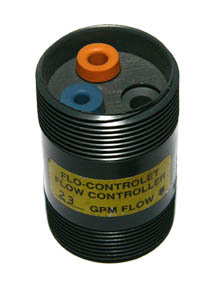 Flow-Controls can be furnished with fewer inserts, for less flow, than indicated above. The Flow Control may be flanged.